I have to admit that the icons were confusing even to me. And I have been using Gmail since the very first beta release (I got in around a month after the launch)! Will this be available for Apps users? Thanks, very useful to revert back to text! I notice the examples use an email that I received as well - Ermm Google WAGE? Shurley Shome mistake Google! Agree, this email probably went to millions of people such as myself dumb enough to sign up for Wave. Funny they can bring "consistency across languages," but the icons are not even consistent between the desktop version and the android version of gmail! Would have been a nice thing to have when launched but it kind of redundant now as everyone has learnt what each the button does. Excellent...even after using them for some time now, I still often have to pause and think about what action I'm taking before clicking the right button. Why did you break it in the first place? Nice tip! I'm glad they introduced the option, I reverted to the old design before this. Computers are for the literate. Icons are a plague given us by Steve Jobs. Nice that google made this available but I've never understood the argument "For example, it's not obvious that the exclamation mark is an icon for reporting messages as spam.". You can simply hover over it, read what it says and simply remember it. If you have to memorize what some button does, then it is not obvious. I don't know what' wrong with my gmail settings, but the option is not there!! I looked for something like that the first time I saw the damn icons because I hate them, I can never be sure what the hell they mean and after reading your post I guessed I had overlooked the option. But no. It's not there in my settings, I've looked everywhere. If you are like me, you are using Apps for your domain. Usually we get features later. Amen. This was a very good thing. I didn't like the confusing icons. I actually prefer text but in some cases I prefer icons, such as the back arrow. Would be nice to mix and match. Back button is like a street sign; turn left. And everyone's favorite Decepticon, Soundwage. "it's not obvious that the exclamation mark is an icon for reporting messages as spam"
It look me a while to work that out too, it's witty, but very droll. I think the octagon it's in is meant to represent a stop sign and the exclamation mark could be a visual euphemism. I guessed they're talking about stopping "enhancement product" spam. 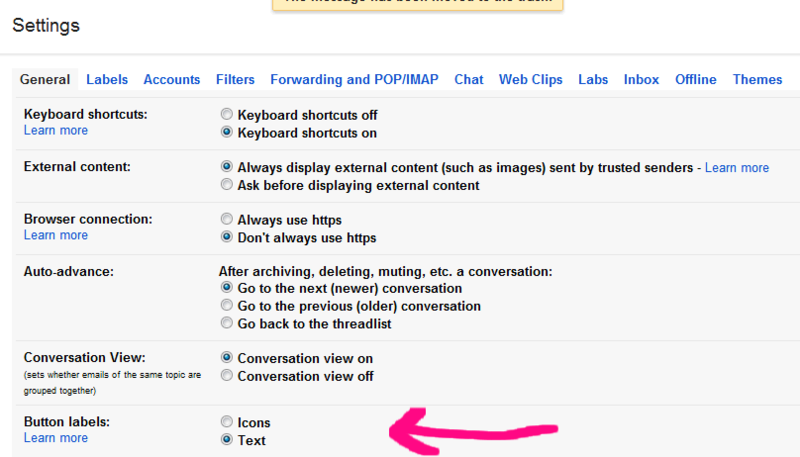 It's "button labels" and you can find in the "General" tab of the Gmail settings page. Here's a screenshot. I cant understand a bloody thing. I have to hit the icon and wait for it to tell me what it did and then quickly hit undo and hope i did it in time. This is rubbish. I cant find the text label option either. I'm using razr ics. have a suggestion. is it possible to make three icons for gmail, contact and tasks instead of the original one button with listbox. would be convenient to click only one button to be able to swich to contacts, tasks or gmail. there is plenty of room free for these extra icons. Thanks for this tip. Just lately my Archive and Spam buttons have turned up blank and my Delete button is a paper clip! Have no idea why. The text at least works.